We tend to be pretty hard on Michael Che around these parts, but that’s only because he often deserves it. His bothsidesism is so strong that he’s defended Sarah Huckabee Sanders and downplayed Donald Trump’s obvious racism, and he has well-documented problems with critics, especially women. (There was also that time he used his Instagram to direct harassment towards former Paste writer Samantha Allen.) 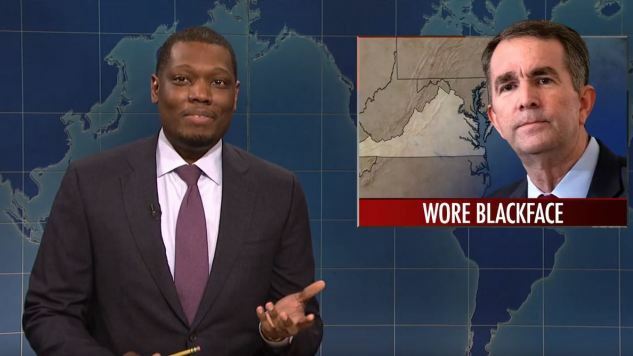 Che and his Weekend Update co-host Colin Jost make their living by telling political jokes on a massive national platform, but rarely ever espouse any actual political viewpoints in those jokes, treating critics from both sides as equally laughable. That’s not good. Sometimes Che is funny, though. Sometimes he even lets his bored facade slip and shows a bit of passion in his material. Such a moment happened last night, when he addressed the absurd blackface scandals rollicking the Democratic party in Virginia, where both the governor and attorney general have admitted to wearing blackface in college. The first part of the video below shows where Che’s strengths lie, and also reminds us that, no matter how frustrating he might be on SNL (and on his embarrassing Instagram account), he’s probably still better to have around the show than Jost.